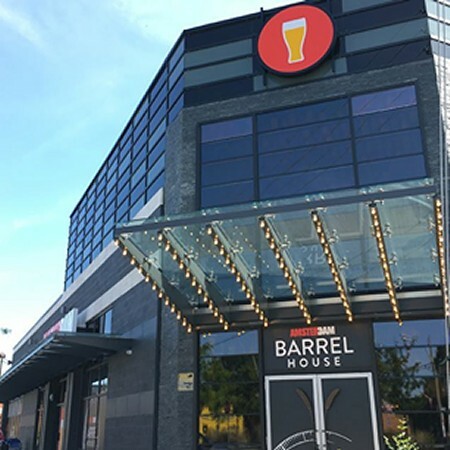 TORONTO, ON – Amsterdam Brewery has announced that its Amsterdam Barrel House brewpub is opening today at 87 Laird Drive in Toronto’s Leaside neighbourhood. Located a short walk from the main Amsterdam Brewery at 45 Esandar Drive, the Barrel House features a full-service restaurant and bar with two levels of indoor seating, a ground level patio, and a rooftop patio, with a total capacity of more than 400. Our new location will be a safe space to experiment with different Brett strains as well as aging with bacteria cultures. Our goal is to continue developing our house wild yeast strain while using the space to test different brewing techniques and raw ingredients. It’s essentially a lab, separate from the production brewery, that we can use to focus on making farmhouse ales that we love to drink. Amsterdam Barrel House will open daily at 11:00 AM and will serve lunch, dinner, and weekend brunch. There will be no bottle shop due to provincial legislation limiting breweries to having two retail locations, but customers are encouraged to visit the Esandar Drive brewery for take home purchases.